America has spent years trying to calibrate immigration policy, with recent tides pushing toward exclusion rather than inclusion. A much earlier instance of U.S. society rejecting immigrants it previously welcomed is the subject of an ambitious and inventive new exhibition at the Tacoma Art Museum, “In Search of the Lost History of Chinese Migrants and the Transcontinental Railroad,” by China-born Seattle painter and University of Washington art professor Zhi Lin. Lin’s project belongs to a venerable tradition of art about injustice, one that traces its roots back at least as far as Goya’s harrowing accounts of the Napoleonic occupation of Spain. Lin’s work is remarkable not only for the sheer scale of his efforts, but also for his unusual array of stylistic and aesthetic strategies. With works ranging from video projection and installation to small, highly detailed landscape drawings and sweeping near-abstractions, the exhibition explores the saga of the Chinese workers who built the Western railroads and were subsequently excluded from white society. 10 a.m.-5 p.m. Tuesdays-Sundays, free Third Thursday from 5-8 p.m., through Feb. 18, 2018, Tacoma Art Museum, 1701 Pacific Ave., Tacoma; $13-$15 (253-272-4258 or tacomaartmuseum.org). For me, the most compelling piece in the show is “On November 3rd along Pacific Avenue in Tacoma,” a Chinese scroll measuring nearly 35 feet long, installed in a wooden case in the center of the gallery. According to the artist, the work in progress (pencil on paper and Chinese ink at this stage) will eventually include such nontraditional elements as typewriter text, neon colors and digital printing. The scroll is based on the landscape panoramas familiar in Asian art, with stylized trees and groups of figures, all seen from above. It was only on second glance that I realized, with a bit of a shock, that an ethnic cleansing is in progress. Fist-waving, shouting and gun-toting Tacoma residents (dressed in the garb of 1885, when the Chinese Expulsion took place) surround and threaten a long, frightened line of fleeing Chinese. Everyone is depicted in a generalized documentary style, except that the Chinese are missing their heads — shown as blank spaces between their shoulders and hats — and the artist has chosen to set his narrative in modern Tacoma, rather than when the incident took place, underlining the connection between past and present. The missing heads are key to Lin’s presentation. 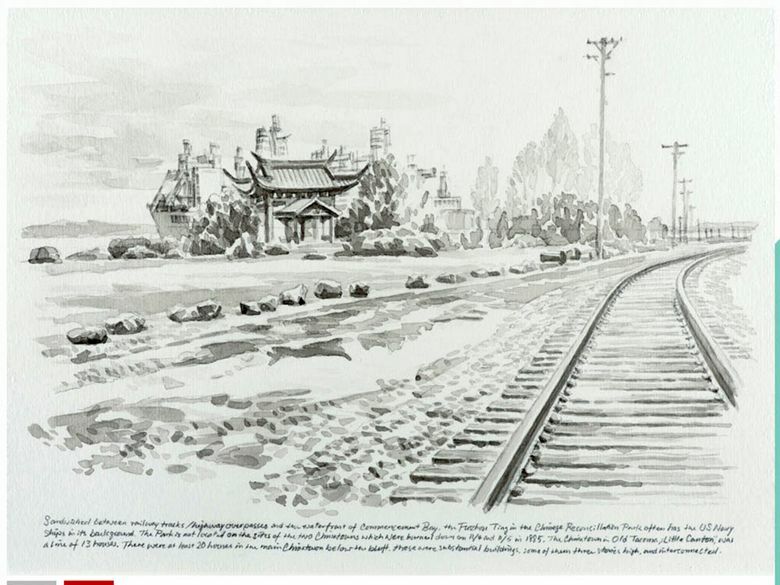 Realizing early in his multiyear research that railroad authorities only recorded their Asian laborers’ first names (and some were left nameless), Lin has determined to bring his vanished countrymen to light without including a single portrait. The most prominent artworks in the show, four semiabstract gestural paintings on paper, depict fragments of headless Chinese workers in harsh and violent environments. Painted with deep colors and simple lines, the works are intriguing but difficult to decipher, and to me they do not have the same impact as other elements in the exhibit. At the far wall of the exhibition is a haunting video installation, an 11-minute film of the annual re-enactment of the Meeting of the Rails in rural Utah. Two steam engines silently chug in from either side, projected virtually life-size on a huge screen. Men dressed in period costumes climb on top of the trains, their backs to us as they gesture for a crowd we can barely see. At a certain moment, they freeze and the screen flashes white; they have just assumed the pose of the most famous photograph of the event. Missing from the video, and the photograph, are the workers, hundreds of whose first names Lin has hand-lettered on a pile of rocks assembled below the screen. Lin has placed us, the viewer, on the wrong side of the ceremony, symbolically sharing the viewpoint of the excluded Chinese laborers whom he is determined to eloquently memorialize. Artist, author and critic Gary Faigin is co-founder and artistic director of the Gage Academy of Art in Seattle.